A synopsis of eminent computer chess programs reveal that they are designed around a 'brute force' approach. An argument is made that by continuing the 'brute force' search approach, computer chess development is moving away from human evaluation methods. Research is done into studies of evaluation methods, and a discovery is made that humans use a form of intuition, called their 'sense of beauty', to choose the best chess move. A paper by Margulies is cited which formulates principles of beauty which apply to chess. Three versions of a chess program are developed, using no heuristics, standard chess heuristics, and beauty heuristics formulated from Margulies principles. The performance of the three versions of the program are compared using chess puzzles, and rated for how quickly they find the solution, and how few nodes they evaluate. Graphs are produced from the results of these tests, showing that beauty heuristics are, on average, 15% faster at finding the solution, and evaluate 10% fewer nodes. An improvement is implemented in all versions of the program which biases the search towards better moves, resulting in the beauty heuristics success rising to an average of 25% faster to the solution, and evaluating 33% fewer nodes, than the other heuristics. 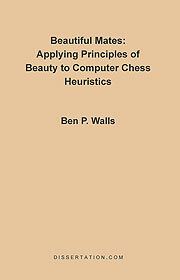 It is concluded that the beauty heuristics are closer to the way that humans evaluate chess positions.